I like the ‘coming and going’ bit of that Psalm. When I was flicking through my bible on the plane this morning I stumbled upon those verses. When I’m on the road I do feel close to God because I’m away from others that I’m very close to. My family and friends. God is who I’m traveling with and its great comfort to know that He’s with me, watching over me. I have a long two weeks ahead of me. And as much as I’m excited to go to China I know that it’s hard place to live if you’re a Christian. I don’t think there’s a high Christian community in Switzerland either. As for the UK….it’s not very British to talk about it! But, God will be with me, which means He’s in all those places. I pray He will shine through me. Even in the London rain. Heavenly Father, it’s a great comfort to know that you’re with us. 3000 miles way from home or a 50 minute train ride. We give thanks for all our blessing and forgiveness when we’re too wrapped up in our work and travels to notice them – Amen! 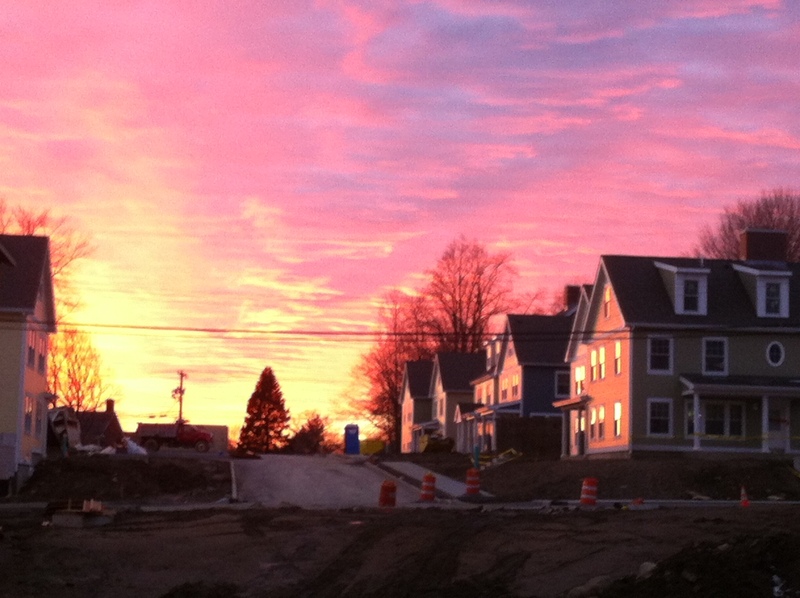 When in doubt post a picture of a sunset! Who’s that person that’s been sitting next to you in the office all these years? It is possible to sit next to someone for years and never really get to know them or we may even get to the point where we stop saying hello to them. The work place isn’t designed for social interactivity, yet that’s where many of us spend the majority of our lives. It is our job on top of our paid job to show Christ to others. A simple invite to grab a coffee with a colleague doesn’t mean to say we’re going to start-up a 50 year-long friendship or throw The Bible at them but it’s simply reaching out and saying ‘hello’. You never know where the conversation might go. There are people out there who are hurting inside but you’d never know it from their demeanor. A gesture that shows we care about them or care enough to have a coffee with them is a great start. We may find out that they are already believers and we’ll have something in common. God does work that way. And even if they don’t follow Christ there will be an opportunity to talk about it with them even in a casual way. I’m not the best at it but I have managed to let people know what I believe in by inviting them to serve or helping out on a project involving the church that requires their skills and ability. People like using their skills to help! The rest is in God’s hands! 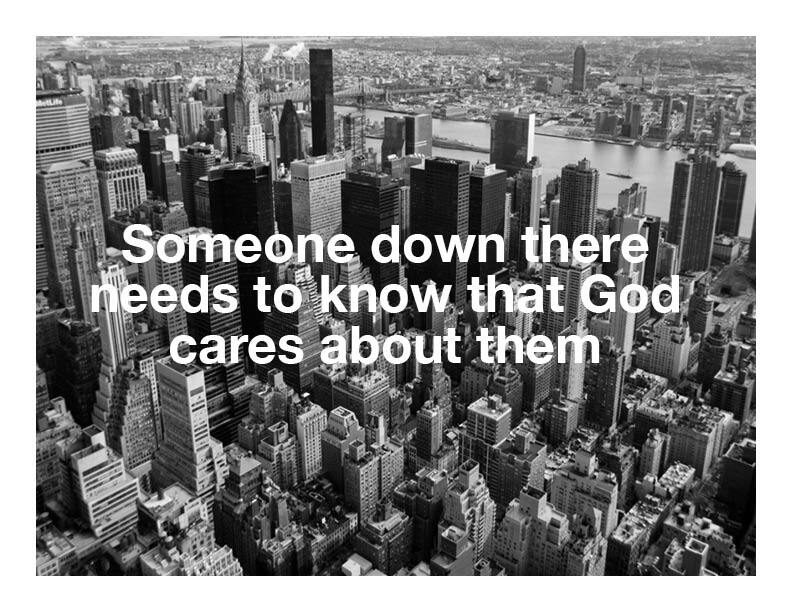 Heavenly Father, Give us the strength to let someone know that you care about them. And for us to find the right words and time to show your love – Amen! Ever thought about wanting less and less? Wanting less things in our lives, like possessions, money, fame and prestige will mean less time we’re putting our energies into chasing those things and more time for God. Also, worrying or being anxious about it is wasted time that could be used for God. Even if we Praying during those anxious moments is a better use of our time. If we have a heart for God, he will provide for us whatever the situation and in ways we’d never think of. That’s written in The Bible (or a version of it) so they’re not my words. In the small amount of time that I’ve decided to want less, I’ve found that nothing has really changed except that I definitely have more time for God and His work. I still have a car but it’s now actually mine and not on loan because I paid it off. I could have sold the car and put a deposit on a newer one but there’s nothing wrong with the one I have. I like having less debt. No one has yet come knocking at my door demanding money and we still have a house to live in. I praise God for that. All is not perfect. I do occasionally surf clothes sites and almost click ‘check out’. Then I realize I don’t need them and click off! So, temptation is still there. It’s hugely stressful to go to work every day thinking that all the responsibility is on us to provide and to also be as successful as we can be. It makes us unwell, tired, irritable and spiritually dry. But once we let go of that full responsibility and look to God through prayer and scripture then the burden is lessened and a there’s a sense of peace that comes with that. So, try wanting for less. If you do, you may find yourself getting more from God in other ways, which is the true reward! Amen! When did you last break the speed limit? I was reading through Matthew trying to find another piece of scripture and I stumbled upon Matthew 7:13. If you read the post last week then you may vaguely remember me asking for your help in reaching out to more people who commute by sharing this blog.The exits at Grand Central Station from the tracks to the main concourse are narrow. We all filter through them, albeit slowly, especially on the lower level. That’s the image I have from the passage in Matthew. But according to the scripture only a few will find their way through the narrow gate but that’s not to say we should give up! I think the corporate world can be the wider gate, the path to destruction. And sometimes I feel like I’m on it. The wider path is quicker, like a 6 lane highway. I speed through it on a mission that’s all about me and I’m going too fast to care about anyone else at work and even my family. My wife shouts as I zoom by…” Don’t forget the girl’s concert next Tuesday”. But Tuesday is gone because I’m going too fast. I’ve already missed it. Going too fast means I can get lost and confused. God may be speaking to me but I’m going too fast to hear Him or see Him. But when I slow down and take the narrower road I notice Him more. I have more time for Him and his word. And I have more time for my family and others. I also feel more at peace and that feels god. I’m on a plane now. It’s going fast but I’ve slowed down. I pray for continuing peace and that when I get to Heathrow airport I can keep going slowly through that narrow gate even in the rush hour tomorrow morning! Heavenly Father, I pray that we can all slow down even if we’re doing your work. Let us notice what you have for us Lord. And not let one of your precious gifts to us, pass us by – Amen! As Jesus walked beside the sea of Galilee, he saw Simon and his brother Andrew casting a net into the lake, for they were fishermen. “Come, follow me,” Jesus said. 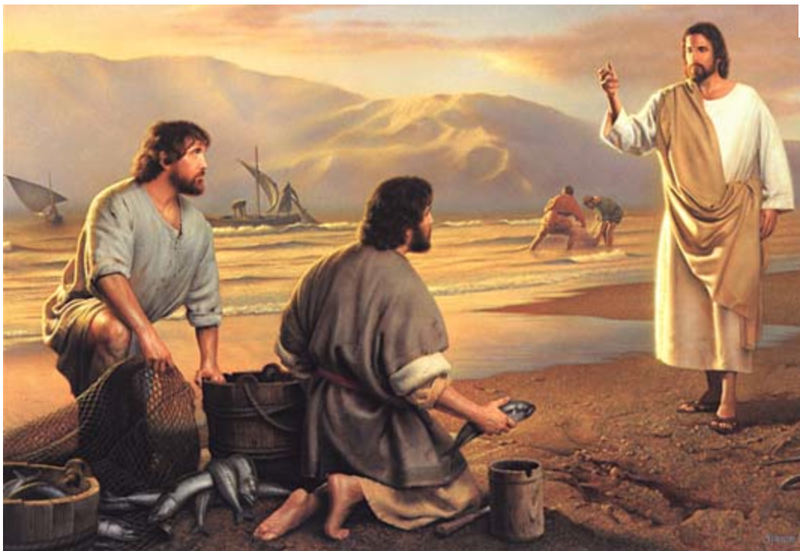 “and I will make you fishers of men.” At once they left their nets and followed him. Sometimes when I look around the train I get thinking about the amount of time we spend on it. Not the time the commute takes, but the years. This week, I thought that it would be really sad if people took the train for 30 or so years but never knew that God could be in their lives. And then how much of a difference that could make if they did know. This blog is designed to reach those people so my wish is to reach as many as possible. Not because I want it to be popular but because they should get the chance to know about Jesus. Most of the people who read this already have a relationship with God. So, if you know of someone who you can share the story of Jesus with, I encourage you to try. This isn’t a bad place to start, commutewithchrist.com. It’s a conversation starter at the very least. There are occasionally cards pinned up in the waiting rooms of Darien and Noroton Heights. Feel free to take them and share them. As it goes on to say at the end of Mark 15:15-16, He said to them, “Go into all the world and preach the good news to all creation. Whoever believes and is baptized will be saved, but whoever does not believe will be condemned.” I prefer the ‘baptized’ part of that passage! ‘Heavenly Father, thank you for sending your son to save us. We pray that we can go into the world and help bring more people to you. Give us the strength, faith and words to be able to do so’ – Amen! How will this year be any different from last year? One thing is for sure. God won’t change. He won’t suddenly deny us and think this year they’re not going to get away with it. Or, I’ve had enough of them! We don’t know what a year will hold for us. We will have ambitions. Things we want to do. Places we want to go. People we’ll want to see more of. There will be certain things we’ll want to change in our lives like eating healthier and exercising more. There may even be renewed energy in how we approach work. The Christmas break can clear our heads a little and give us a more positive approach to work. But, if you’re anything like me, all that may probably only last a few weeks and then the usual will kick in. The same patterns and the old habits. Almost like it’s not a New Year at all. It may as well be last year or the year before. But while God remains unchanged we can change our relationship with Him. It may be a cliché but if you’ve never read the bible from front to back then it’s possible to do so throughout the year by receiving a verse everyday. Scripture really is the only way to keep in touch with God and with all the issues we face day-to-day, I’m always amazed how the verse can somehow relate to them. My very first post was about us working for God not an organization. The organization is the vehicle for us to work for God. If we truly are working for God then we need the work handbook available to us every day. The Bible. You can sign up for a daily verse at www.bible-reading.com. I like the way scripture is ordered. Let us make 2013 a year when God changes us and not us trying to do it alone. Heavenly Father, we ask you to be with us this year. Give us the tools necessary to represent you in our workplace and guide us skillfully through any challenges and difficulties we face so we may have a closer relationship with you – Amen!